Raw food is live food, living foods consists of fruits, vegetables, nuts, sprouted seeds, beans and grains that aren’t cooked. Raw food is not heated above 118ºƒ, by not heating food, all the naturally occurring vitamins, phytonutrients, water and enzymes are left intact and alive. Food heated over 118ºƒ looses approximately 50% of its protein. On average 50-80% of the vitamins, minerals, water and enzymes naturally occurring in food are destroyed when cooked. Enzymes are the catalyst for every chemical function in your body. Vitamins, proteins and hormones can’t do their job without enzymes. Every living food naturally contains the exact amount of enzymes needed to be properly broken down and utilized. When eating cooked foods you must produce extra enzymes putting an unnecessary burden on your entire body. Eating living foods helps to reverses the aging process by providing the body with all the enzymes required to repair cellular damage and create millions of new healthy cells every day. Raw foodists report significant improvements in their overall health, increased energy, significant weight loss, improved mental state and stronger immune system. 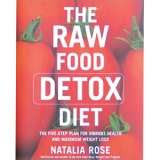 In the book “In Defense of Food” Michael Pollan points out that “Four out of the top ten causes of death today are chronic diseases with well-established links to diet: coronary heart disease, diabetes, stroke and cancer.” Many people who enjoy a raw food lifestyle have been able to heal themselves of these diseases. Eating living foods also slows down digestion so your food is properly absorbed. Proper digestion keeps blood glucose levels steady and will efficiently cut down on food cravings. Therefore, people who eat raw foods also lose weight.